Android's Destiny: the iPad's Path? Watch out Apple iPhone, Google's mobile operating system, Android continues to increase its popularity at a growth rate of 32 percent year over year, according to a recent report. Mobile advertising provider and metrics firm AdMob, recently acquired by Google for $750 million , released on Tuesday its March 2010 Mobile Metrics Report that includes some interesting data about the growth of the Android operating system. 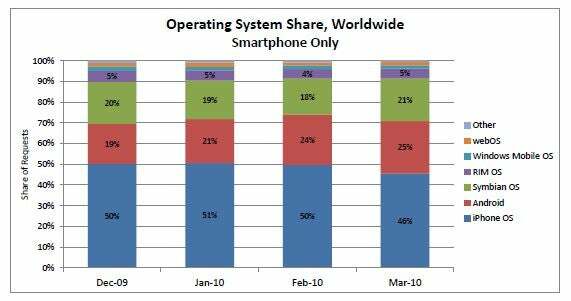 The report also adds more fuel to the argument that Google's Nexus One really might be a successful flop . Admob's metrics data is based on ad requests from 18,000 mobile Web sites and iPhone, Android, webOS, and Flash Lite applications that have partnered with Admob's advertising network. Thirty-four different handsets from 12 manufacturers contributed to Android activity on Admob's network during March, but just eleven of those devices accounted for 96 percent of all Android-based traffic. That is a significant increase in devices when you consider that Admob reports only two devices accounted for most Android traffic just six months earlier in September 2009. The Motorola Droid was the leader of Google's Android army in March, accounting for 32 percent of all of Admob's Android-based traffic. More interesting, however, is news that Google's marquee handset, the Nexus One, made up only two percent of Android Admob advertising requests in March. Google made headlines earlier this year when the search giant decided to sell the Nexus One unlocked and directly to consumers, instead of through a mobile service carrier. Google has since backtracked on this decision, and recently announced it will bring the Nexus One to the United Kingdom and Europe in partnership with Vodafone. Google is also nudging customers in the U.S. to stop waiting for the Nexus One to come to Verizon, and instead opt for an Android-based HTC Incredible . Admob's also points, albeit indirectly, to a growing problem for prospective Android users. Namely, the confusing number of Android operating systems available on a wide range of handsets. 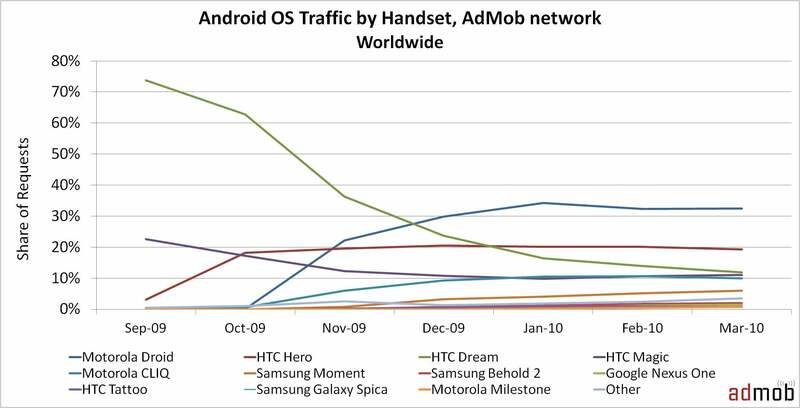 Thirty-eight percent of Android handsets in Admob's mobile network were running Android OS 1.5 in March, 35 percent had either OS 2.0 or 2.1, and 26 percent had OS 1.6. This is problematic since a new Android-user could potentially go into a store today and pick up a brand new device like the Motorola Cliq running Android 1.5. But new Cliq customers would be missing out on some of the great features currently available on later versions of Android such as free turn-by-turn GPS (U.S. only). Google has tried to remedy this by making some features, such as free turn-by-turn GPS , available to earlier versions of Android. But this strategy is, in the long run, confusing for customers and unsustainable as Google continues to release newer versions of its mobile OS. Apple's iPhone, by comparison, lessens fragmentation by making its updates available to almost all of its older handsets, such as the original iPhone and the iPhone 3G. Apple can also prevent version fragmentation since you can only purchase from Apple a new iPhone device running the latest version of the iPhone OS. There were some other interesting metrics of note in Admob's report. The iPhone still dominates the Admob network worldwide with 46 percent of all ad requests, compared to second place Android's 25 percent share. But in the United States Android took 46 percent of all Admob traffic, with iPhone devices lagging behind at 39 percent. 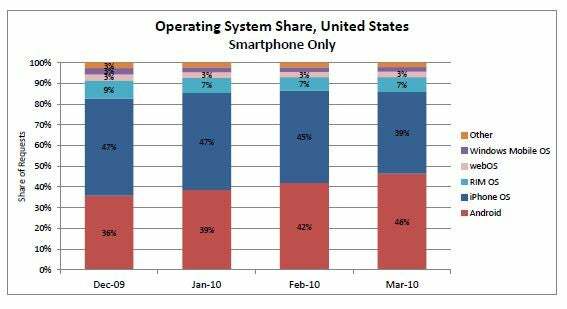 It will be interesting to see if, in the coming months, Android can continue its strong growth, and maintain its current dominance in the United States. Or if the April release of Apple's iPad , and the subsequent sale of 500,000 devices in less than a week , will push Android's popularity back to second place. Connect with Ian on Twitter (@ianpaul ).